From Accumulation to Distribution: A Retirement Crossroad. As originally appeared in MarketWatch’s Retirement Weekly. What’s been my greatest advice to people once they seriously consider retirement? No it’s not create a budget. Take notes. Life is about to get bumpy. Money is at the bottom of the life list for surprises. There are enough academic studies that prove how people with formal retirement planning are more successful than those who don’t plan. No, there’s another storm front to weather. 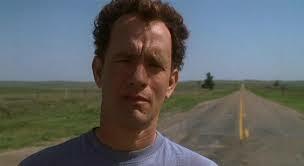 In the 2000 film Tom Hanks portrays a frenetic FedEx systems employee obsessed with time and productivity. During a Christmas evening flight to Malaysia, his delivery plane crashes in the Pacific Ocean. He is violently tossed and cast to a remote island where he remains trapped and surrounded by cascading ocean currents. Over four years, while loved ones consider him lost (they had a funeral), and the love of his life marries and moves on Chuck Noland survives, too. The drama is layered with lessons of acceptance, perseverance, resourcefulness and a shift in perspective that takes Tom Hank’s character to a rural Texas farm-road crossing, an old FedEx truck route he’s traveled before. Although this time, the weight of his decision is heavy. It will change his life forever. Once that retirement decision is made you’ll feel that weight. You’ll stand on a double-yellow line at a crossroad. Which direction will you turn? Here are a few lessons to navigate the first and most stinging waves of retirement. Those truly ready to retire have a sixth sense of sorts. You will too. As the FedEx plane plummeted from a stormy night sky, the odds of human survival were remote. As the aircraft broke apart and sank like a stone, Chuck’s instincts kicked in. Miraculously, he made it to the surface. Pre-retirees seem to sense when their employers’ planes are headed in a different direction than they are. Those I counsel often reference turbulence at work they no longer find appealing or willing to accommodate. Stressful projects, new bosses. The changes that were easy to overcome before are no longer palatable. If you plan accordingly for retirement, 5-7 years out, you’ll be able to control your escape, maintain focus on an exit. Like Chuck, an event will motivate you to flee. There will be a sense of urgency to depart. For example, a client who recently retired from a large corporation turned in his resignation one day before the executive suite announced the sale of the finance unit he had worked in for 16 years. That’s the uncanny sixth sense I’m talking about. Be open to the message. The first year in retirement can be challenging. Prepare to churn through darkness, all the time jolted by waves of self-discovery. When Chuck Noland surfaced he was nowhere out of peril. In the middle of nowhere there was still quite a way to go before safety. Even those with a well thought-out financial plan are not completely prepared for retirement. The emotional part, anyway. It’s a span of dark distance I call “the black hole” as you cross from accumulating wealth to depending on it. New retirees feel vulnerable through this stage. They go through the motions. They seek a destination. A place that is not on a map because it’s created by the retiree traveling the path. During the first year in retirement, give yourself a chance to accept life changes. Let the waves jostle you. Use time to re-discover who you were before a 40-year career dominated your life. This should be a new and enriching journey, however it begins with turbulence. As you travel from accumulation to distribution, don’t completely sever the threads of your former environment. 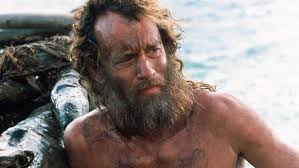 In Castaway, Chuck Noland maintains his watch on Memphis time. It’s comforting to return to hours you remember pre-retirement. Recall the best about the wealth accumulation years. Nothing about you has changed. Except days formerly occupied with deadlines and meetings are now on a clock personally designed and followed by you. A redesigned sense of value will eventually emerge but not without connection to who you were because it’s still who you are. Isolated on a tropical island, very unfamiliar territory, the former hard-pressing executive who overlooked what’s truly important now finds survival with simple things he finds inside water-logged FedEx boxes that wash onshore. Items that connect him to life before the crash. It anchors and helps him prepare mentally for this present condition. He manages to keep near always an antique pocket watch. A Christmas present from his girlfriend. Her photo inside. It provides focus from the time of the ill-fated flight until he’s found floating almost dead, by a cargo ship. She is Chuck’s motivation to survive. His purpose. I advise new retirees to focus on applying tenured ambitions to ventures that nurture their meaning, not their ambition. Core skills can be applied with meaning to hobbies, charities, part-time employment and travel. People, too. I observe retirees live again by spending resources on grandchildren. They’re not buying electronics or clothes or toys either. They’re purchasing experiences. Who and what will be with you on that island called retirement? Confide in a listener. Chuck Noland’s confidante was a Wilson-brand volley ball aptly named Wilson. The smiling face on the surface formed from a bloody hand print. 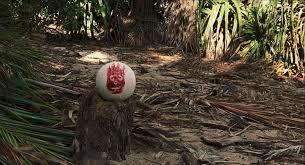 Wilson became a source of comfort, a way for Chuck to work through a survival and ostensibly a harrowing escape plan. Retirees find great comfort sharing their emotional concerns and fears with others, especially through the first year. Spouses and close friends become anchor points. 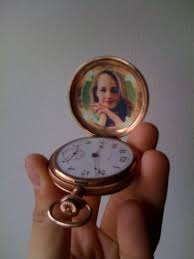 Human pocket watches. Financial advisors can add piece of mind by reviewing retirement plans and budgets with retirees on a regular basis. An objective voice that provides consistent validation that their plan will work is crucial. I have witnessed some of the greatest emotional and creative discoveries from retirees in the beginning years as long as they share open dialogue with people who care to listen. I have read magnificent works of fiction writing, observed great paintings and other inspired works from former accountants, attorneys and other hard-driving right brain individuals who didn’t appear to be artistic at all. And I’ve known many of them for over a decade. Chuck Noland would have never made it off the island without Wilson. I’m convinced. There was a wall of thought and belief to climb before a makeshift raft with a portable toilet sail could be constructed strong enough to encounter the terrifying tides which bordered the island. Define and live your themes. In your past life there were goals. Whether hit or miss, you defined yourself by them. So did Chuck in his FedEx life. Goal setting will not enhance your retirement. Themes will. Think about it: Accomplish a goal and you immediately set another. Enjoy it briefly and anguish over the next one. If you fail, you become discouraged. Goals are no-win for the creator. They are human hamster wheels. At the conclusion of Castaway, Chuck Noland was not driven by goals. He was no longer the same person. A roadmap of Texas, sunroof open, donned in sunglasses, he was immersed in the freedom of the path. In the passenger seat a new volleyball and an unopened FedEx package he carried throughout his ordeal. On the surface of the weathered-worn box a pair of painted angel wings now faded. There was one last delivery to be made before continuing a new adventure. Chuck finds and leaves the package at the address of the sender along with a note that the package kept him alive. Chuck stops to study a map at a crossroad not far from the ranch house. An attractive woman in a pickup truck pulls up alongside him. “Where you headed?” she asks. As the truck pulls away, Chuck notices the wings painted on the back of her truck. Identical to the ones on the package. He turns toward the road she’s traveling and smiles. Retirement should be focus on roads you seek to travel. Each has meaning. Every rock under the tires is an experience to feel. Let the themes you wish to follow reveal their destinations. There’s a new life in the gravel. Some of the best advice I provide to retirees has little to do with money. The woman took my business card. She called me. This entry was posted in Uncategorized and tagged castaway, emotions, financial planning, retirement by Richard M. Rosso, CFP. Bookmark the permalink. In retirement, follow again what makes you human. Re-discover what you lost before you were a slave to the clock.